A contemporary hotel located on the Alabama Gulf Coast, just 1/2 mile from the Alabama Gulf Coast Zoo and leass than 2 miles from the Gulf Shores Public Beach. Gulf Shores Alabama is a popular family vacation destination on the Alabama's beautiful Gulf Coast with activities including dining, dolphin siting cruises, championship golf courses, kayaking, deep-sea fishing charters and nature hikes. Choose from national hotel and motel chains, camping or a variety of beach houses for your stay. There are numerous options for nightlife and family entertainment from theme-parks to sailing excursions, enjoy your pick of plays, free concerts, dancing or just listening to a variety of music. Details: Get great value at a Southern hospitality inn on Alabama's Gulf Coast. Start planning your affordable beach vacation today. We have king, two double bed, mini-suite and guest rooms available! Details: Visit our fully renovated, new state-of-the-art lobby featuring the Bistro. We are conveniently located to all points in Gulf Shores. Details: We offer a range of amenities in all our rooms, including microwave, refrigerator, hair dryers and free HBO. The third floor outdoor pool overlooks the Gulf. Details: Best Western on the Beach is your tropical vacation destination, offering all the comforts of home. Spacious Gulf-front accommodations with indoor and outdoor pools. Enjoy the convenience of the Island Pancake House. Details: At Staybridge Suites every room is a full suite equipped with a kitchen and living room. A breakfast buffet is included. We are a pet friendly hotel with an onsite pet park. Details: Amenities at the pet friendly Magnuson Hotel in Gulf Shores include a complimentary breakfast, indoor pool, hot tub and free parking. There is free high-speed wireless internet and a business center. Details: Multi-night deals, romance packages, birthday packages and meeting room space available. Rates include free local and long distance calls, WiFi, and breakfast. Amenities include guest laundry, fitness center, outdoor pool and more. 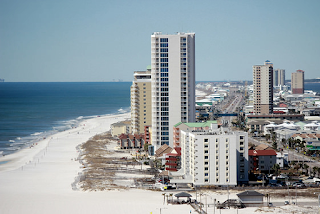 Gulf Shores is situated along the Gulf of Mexico and has subtropical weather, it is the southernmost community on Alabama's Gulf Coast, with Orange Beach bordering it to the east, and Fort Morgan/Mobile Bay is to the west. According to the U.S. Census Bureau, the city has a total area of 28 square miles, consisting of 23.2 square miles of land and 4.8 square miles of water. Gulf Shores has an array of outdoor activities and accommodations for visitors; lodging ranges from gulf-front vacation rentals to popular hotels like the Phoenix All Suites Hotel and the Courtyard by Marriott at Craft Farms, making the area a popular family vacation destination.